One day, back when I was living in San Francisco, I was at a restaurant with some friends, and one member of our party arrived a bit late. Before sitting down, he started heading toward the corner of the room, and when someone asked where he was going, he held up his hands and said, “Demunification.” Although I had never heard that word before, I understood immediately what he was saying: he was heading to the lavatory to wash his hands in order to “de-MUNI-fy” them—MUNI being short for San Francisco Municipal Railway, the transit authority that runs the city’s buses and streetcars. When you’re riding a bus or streetcar that’s so crowded you have to stand, you end up holding onto the handrails, which perpetually feel (and probably are) grimy from being handled by untold thousands of people before you. Almost everyone I know who rides MUNI habitually washes their hands as soon afterward as possible, which is probably an excellent idea. From time to time I’m in some sort of social situation where a handshake is expected, but my hands are not necessarily clean. This always makes me feel awkward—it’s one thing to decline a handshake when my hands are covered with motor oil or pastry flour, but in the absence of visible contaminants, North Americans typically consider it an insult not to accept a handshake. Meanwhile, personal observation informs me that an unknown but excessively high percentage of men routinely leave public restrooms without washing their hands. Thus, shaking hands strikes me as a relatively unsanitary gesture of greeting. Not that I’m hypersensitive about germs, but this made me wonder: considering the wide range of alternatives, how did the handshake come to be the standard greeting in this society? And hygiene aside, how can we make sense of all its supposedly deep and symbolic meanings? I’ve read at least half a dozen contradictory accounts of the origin of the handshake. Because handshakes clearly predate written history, all these explanations are ultimately somewhat speculative. But the most popular story is that an open right hand showed you were not carrying a weapon; if two men met and displayed empty right hands, this presumably meant a basic level of trust existed that neither would stab the other. In one variant of this story, the handshake evolved from an elbow-to-wrist “patdown” to check for hidden knives; in another, the shaking motion was supposed to dislodge any sharp objects that may have been kept in the sleeve. Of course, these explanations, while plausible enough, don’t account for left-handed men, who presumably would have been happy to extend the right hand in greeting while wielding a dagger in the left. But in many parts of the world, since ancient times, the left hand has been considered the “bathroom” hand, the one never used for eating, giving, or receiving—nor, by extension, for greeting—whether you’re left-handed or not. Meanwhile, the “I’m-not-going-to-stab-you” story doesn’t tell us why the handshake won out over other greeting gestures in the West. After all, in some cultures the standard greeting (even between people who don’t know each other well) is a kiss on one or both cheeks; in others, people hug, rub noses, bow, or even stick out their tongues. Writer Margaret Visser suggests one possibility. As she noted in her book The Way We Are, at one time the English were more demonstrative with their gestures of greeting—for example, English men routinely greeted all women with a kiss on the mouth. As part of the Victorian behavioral “reforms,” public kissing of any kind became socially unacceptable and the handshake came into fashion for both men and women as a convenient way to keep a person at arm’s length. So to speak. At least in the United States, the handshake has become an extremely ambiguous symbol. 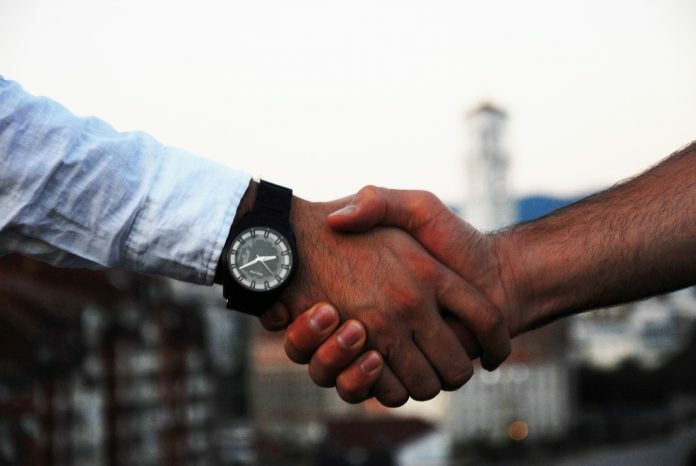 At one level, it just means “hello” or “goodbye.” But it can also be construed to mean “we’re in agreement” or even that an informal contract has been reached, as in the proverbial handshake deal. And on a still deeper level, it can mean “everything’s OK between us,” particularly after some conflict has been resolved. But sometimes social convention awkwardly calls for shaking hands to signify the end of a meeting, even though no agreement has been reached or a state of conflict still exists. And heaven forbid that one world leader should shake hands with another whose ideology differs deeply, since people on both sides will judge this as a disingenuous move at best, and at worst, a betrayal of the leader’s values. But was the politician saying, “I accept you and your beliefs” or simply, “Hello”? Then, of course, business types will read all sorts of meaning into the very style of your handshake. Even if you execute it under exactly the right circumstances, it must be firm but not too firm; it must be held for exactly the right amount of time but no longer; it must be accompanied by direct eye contact; and, for bonus sincerity points, you should add your left hand to make a “hand sandwich.” You may also be judged on the angle of your hand and the number and intensity of shakes. And if this kind of confusion isn’t bad enough, that’s just the standard, run-of-the-mill handshake. Gangs sometimes use special handshakes to signify group membership, just as fraternal societies and children’s clubs use “secret handshakes” as a kind of password, a symbolic way of saying, “We’re insiders.” So if someone outside the group incorrectly attempts a handshake, the results can be quite serious. On the other hand, a high five (arguably a variety of handshake) pretty unambiguously expresses satisfaction or congratulations—but that’s the exception. Note: This is an updated version of an article that originally appeared on Interesting Thing of the Day on September 3, 2004.